Hubble Space Telescope's newly repaired Advanced Camera for Surveys (ACS) has peered nearly 5 billion light-years away to resolve intricate details in the galaxy cluster Abell 370. 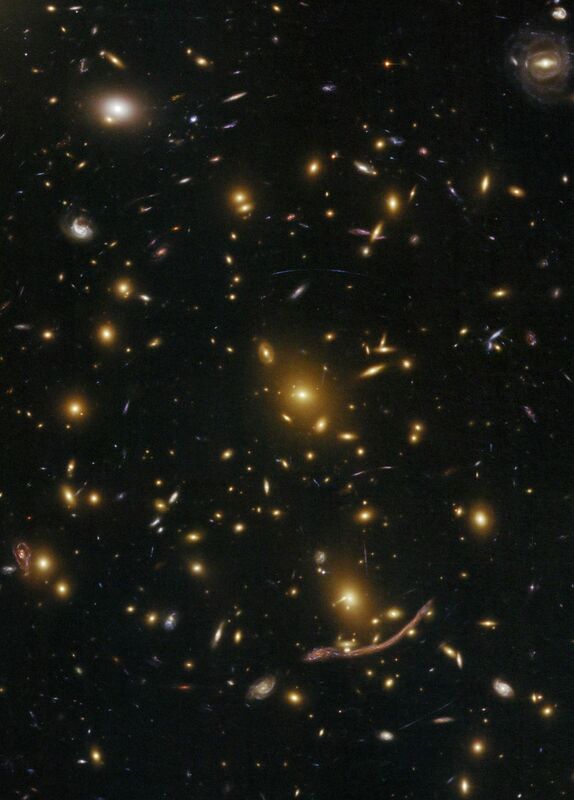 Abell 370 is one of the very first galaxy clusters where astronomers observed the phenomenon of gravitational lensing, where the warping of space by the cluster's gravitational field distorts the light from galaxies lying far behind it. This is manifested as arcs and streaks in the picture, which are the stretched images of background galaxies. Gravitational lensing proves a vital tool for astronomers when measuring the dark matter distribution in massive clusters, since the mass distribution can be reconstructed from its gravitational effects. Ground-based telescopic observations in the mid-1980s of the most prominent arc (near the right-hand side of the picture) allowed astronomers to deduce that the arc was not a structure of some kind within the cluster, but the gravitationally lensed image of an object two times farther away. Hubble resolves unseen new details in the arc that reveal structure in the lensed background galaxy. Galaxy clusters are the most massive structures of the universe, located at the crossing of the filaments of the cosmic web of dark matter. The most massive clusters can contain up to 1,000 galaxies and intergalactic hot gas, all held together primarily by the gravity of dark matter.